Members attending the New Democratic Party ’s convention voted to add free post-secondary tuition to its platform in the closing hours of its weekend-long gathering in Ottawa on Sunday, setting the stage for the Canadian national election in 2019. The resolution to eliminate all tuition on a national level was first put off the day before for further consideration, but delegates voted in favour of adding the policy to the official party platform but offered no detailed plan on how it would be covered. Efforts to address inequality, improve party democracy, build affordable housing, amend bankruptcy laws and install “universal pharmacare” were all addressed at the conference. 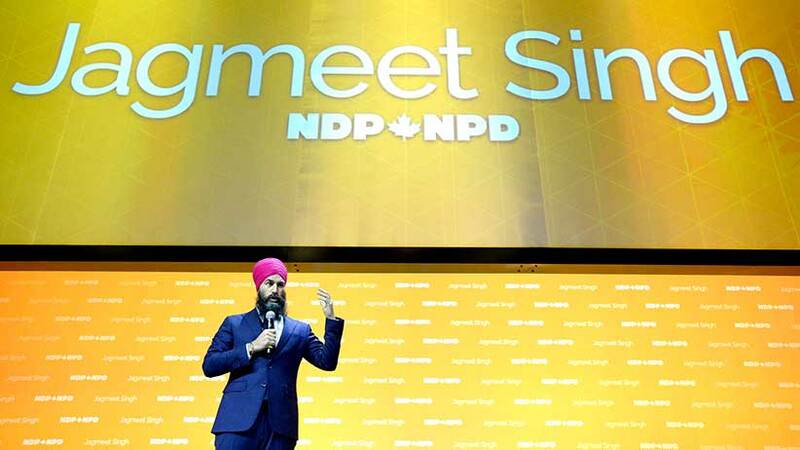 “The time for timid is over,” NDP leader Jagmeet Singh said Saturday in a quote that headlined much of the Canadian media coverage of the convention. In what was described by analysts as a bold move, Mr. Singh proposed decriminalizing all drug use, a resolution that was passed by party delegates along with a federal ban on the police practice of carding attributed to racism. “We need to have the courage to get the job done,” the leader told a full room on Saturday. Provincial new Democrat leaders John Horgan of British Columbia and Rachel Notley of Alberta were not in attendance at the gathering. The two premiers are feuding over the status of the Trans Mountain pipeline. Delegates voted a resounding 90.7 per cent in a mandatory leadership confidence vote to keep Singh as the party leader in that last convention before the next federal election. Despite being near the forefront of the 2016 convention, the Leap Manifesto took a backseat for the main event over the weekend, with its supporters holding their own event on Friday featuring left wing organizers from the United States and Britain that Singh did not attend. The document outlines environmental and economic policies that aim to curb fossil fuel development, utilize renewable energy and bump up taxes on corporations. There was one attempt to bring a Leap policy to the NDP platform on Saturday that would have had the party support the right of provincial lawmakers to “protect their environment from federal energy decisions” but was turned down in a resounding “nay”, reported Maclean’s magazine. There were 398 regular resolutions for the NDP before the weekend and the party 42 were debated with most of them passing. More details to follow. Image of Jagmeet Singh at the conference Saturday from Justin Tang/Canadian Press.